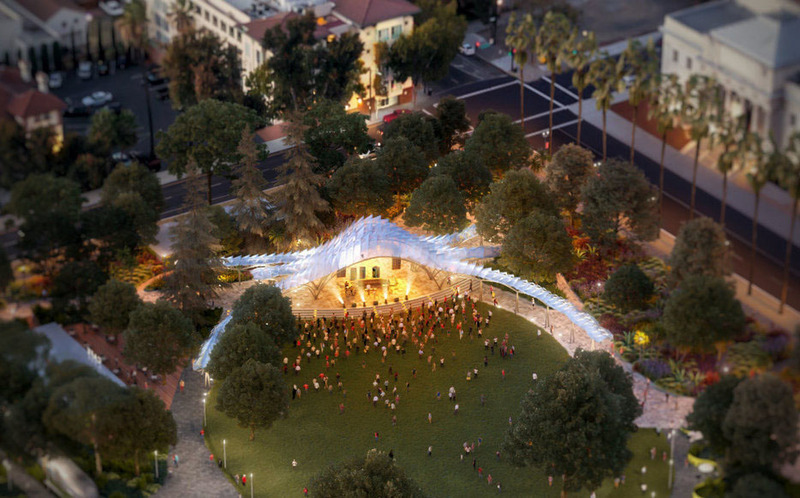 It was playwright and poet Johann Wolfgang Von Goethe that said, “Music is liquid architecture; Architecture is frozen music.” Our design for the San Jose Levitt Pavilion, supported by the Levitt Foundation and The Friends of Levitt San Jose, took its initial inspiration from music and performance. Three suspended structures flow together to form a dramatic central crescendo, then fade away into the surrounding urban forest. Dubbed the "Dragon Pavilion" by local residents due to its serpentine-like glowing form, the pavilion's suspended overlapping panels give the structures a sense of dynamism and buoyancy. In the evening these dramatic sculptural panels, set against a backdrop of tall trees and plantings, will create a light-filled icon for the park, neighborhood and city. The pavilion fits seamlessly into the new St. James Park network of pathways and lawns. The shade canopies create an inviting place to stroll day and night. Shade canopies wrap around the lawn adjacent to the new park cafe. One of the driving concepts of the pavilion was to create an open structure that would be light-filled and transparent to allow the citizens to enjoy the shade canopies throughout the day as well. The pavilion would support programs such as an open air cinema at night, concerts, recitals and theatrical performances.